If Mortgage Rates Tick Up Even a Little, What’ll Happen to Canada’s House Price Bubble? The question now being asked, years too late: How will this end? “Homeowners and potential first time homebuyers are now even more vulnerable to a payment shock from rising mortgage rates,” the National Bank of Canada warns in its housing affordability report. Eight years of super-low interest rates in the US have succeeded in inflating home prices in many cities way past the peaks of the housing bubble that imploded during the Financial Crisis. A boom-crash-boom movement. But home prices in Canada barely dipped during the Financial Crisis and then continued soaring. So a boom-boom movement. Canada’s largest markets – the metros of Toronto and Vancouver – have made it into the bubbliest housing markets in the world. After eight years of aggressive monetary easing around the globe, and super-low mortgage rates, topped off with home prices soaring over 30% year-over-year in Toronto in March, even the Bank of Canada and the provincial governments are beginning to fret. The question now being asked, years too late: How will this end? And more specifically, what will happen when mortgage rates tick up even a little bit? The worsening of affordability in Q1 was the seventh in a row, the longest run in almost 30 years. As a result, our national composite is the least affordable in 7 years. For some time, the problem of affordability in Vancouver and Toronto was limited to the non-condo segment, but the housing boom has spread to the condo portion as well. As a result, the condo market in those cities is also the least affordable in several years. Housing affordability is a function of down payment, monthly payment, and household income. With home prices skyrocketing while household incomes were lagging far behind, low mortgage rates were the grease that kept it going. 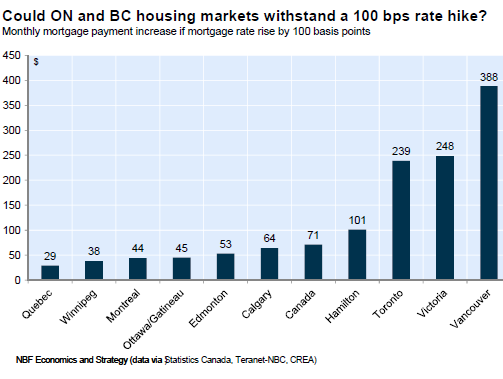 An increase in interest rates of 100 bps [1 percentage point] on a 5 year term would represent a rise of C$388 for the monthly mortgage payment in the Vancouver market (+9% to C$4,669) and C$239 in Toronto (+7% to C$3,692). With housing affordability problem in these markets being already acute, we doubt current home prices could resist such an interest rate hike. 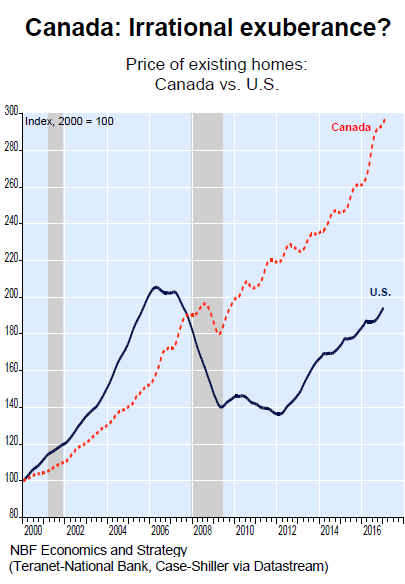 So just how big is the Canadian housing bubble? This house price inflation – when the dollar loses value for house purchases – was further stimulated by the transformation of the concept of “home” into a global asset class that investors and speculators around the globe use for their own purposes, just like they use stocks or bonds or currency speculation. Like so many other assets classes in central-bank nirvana, this one too has reached ludicrous levels. But there’s a difference. People don’t live in stocks, bonds, classic cars, or art, and these asset bubbles have less impact on the real economy. But people do have to live in homes. Now that the results are clearer than daylight, central banks and governments worry about the consequences: Bubbles don’t just plateau. Now they wonder, belatedly, how to get out of it without bringing the whole construct down. The fact that a 1-percentage point increase in mortgage rates poses existential questions for some of the hottest markets shows how far policy makers have painted themselves into a corner. What makes anyone think that rates will go up meaningfully?? They won’t. Take a look at debt levels here in the USA. Every category except mortgage is at record levels. And it appears mortgage requirements are dropping like a rock. When central bankers can print money to buy stocks and bonds, then anything can happen. If I told you 8 years ago the federal reserve would only raise interest rates 75 basis points, I would have been laughed out of the room or told then the USA would have to be in a severe recession. 2% inflation…..seriously? Maybe another 25 basis point increase here and that’s it. Next leg in interest rates will be down. “25 basis point increase here and that’s it”. As the amount of debt mounts, so does the cost of servicing that debt. Rates must remain low to negative for the system to survive. And the low rates create speculative mal investment. The higher the values for homes and commercial real estate goes, the more the Banksters make.. as they make a set % for loan origination and then sell off the loans. Study after study, history shows that the greater the inequity the more unstable a system becomes. We are on the road to ruin. True, government and CBS will just sit on their hand and watch all these bubbles inflate further. The only thing that will forces their hands is inflation, and a lot of it. The only thing that will forces their hands is inflation, and a lot of it. There should be deflation, given the way the middle and working classes in this country are being pauperized and pushed deeper into debt serfdom by globalism. But with central banks creating trillions in “stimulus” out of thin air, inflation is going to manifest with a vengeance as Yellen & Co. print us down the road to Weimar 2.0. When all else fails? Take the nation to war. Searching for confirmation. If true – its bad. War. BIG war. @OutLookingIn, “Courageous Channel” has been going on every year for a few years now. Here’s one official press release from 2014. The 20 trillion dollar monkey on our backs is not going away, and the CBO forecasts it to be $30 T in a decade. At the same time our GDP growth is under 2%! This is not a recipe for optimism IMO. Turn the clock back to the beginning of 2007, and the 1 year T-Note was at 5%. One other result of higher mortgage rates to add to housing (un)affordability is the slowing down of housing construction which will also slow down the economy. “Rates must remain low to negative for the system to survive.” Yup, eleven words are all that’s needed to sum up where we are; well stated OutLookingIn. For eight years now, “Zimbabwe Ben” Bernanke, Yellen, and their flying monkeys at the Fed have been jawboning incessantly about mythical rate hikes, then always coming up with creative excuses to punt yet again based on mumbo-jumbo about “the data” or some such thing. Yellen will never raise interest rates of her own volition, as ZIRP and near-ZIRP rates are the Fed’s most lucrative swindle against savers and pensioners, while forcing yield-seekers into Wall Street’s rigged casino where they can be fleeced at will by the Fed’s partners in crime. So yeah, I’m with you, Steve, Yellen will institute NIRP if she can possibly get away with it. Courageous Channel is done every year. I just found this out with a Google search. They are well practiced in evacuating Americans from South Korea. Now the big question is, what would happen to Seoul in the event of a military strike on the North? What would happen to the World? I think the criminals are runnin the prison. Ooops, they always have…my mistake. That’s right, Paulo, there are all sorts of war games and various exercises going on in and around South Korea every year. Most are based on unreal scenarios and would fall apart the minute hostilities started. Spent one year in SK and went through a number of these things. So what happens if hostilities were to break out? Well, IMO, it depends on who gets the ball rolling and strikes first. A first strike by NK would inflict the greatest amount of damage to Seoul, US, and SK forces. As far as Seoul is concerned it would depend on the type of weapons used, in particular if the artillery shells used had bio or chemical warfare agents in them. Traditional HE shells would cause a large amount of physical damage, but the other types would, IMO, be more devastating. Speculation in the press has indicated that NK has some nuclear weapons and I doubt that they would be used in a first strike by NK as that would mean they have concluded that they are done for. You can guess what the US would do in a scenario like that. I hate to say it, but if there is going to be war a first strike by the USA & SK would probably result in the least amount of damage to SK and a better outcome. This would of course have to be undertaken in a secretly organized massive strike done without warning as to inflict the most damage possible in a short period of time to take out the NK artillery that could strike Seoul, its missile sites, and nuclear weapons. Does the USA has the capability to undertake such a strike? Thanks for the continued great articles Wolf. Looks like the final overbuilding is occurring all over the gta. The provincial govt enacted the green belt in the early 2000s. This locked up a vast quantity of land which has sat vacant for many years. They have just recently lifted parts of the locked up land available for builders. Home construction has been booming in the outter burbs after the land release. The green belt has severely restricted the housing supply and contributed to this bubble. Had the govt not enacted the green belt, prices would be a lot lower than today. Signs for $50k home equity loans litter my drive around town. No credit checks, quick closing. The bank of Canada and all levels of govt may have a couple more bullets in the chamber to keep the bubble alive. Look at Vancouver, they had the foreign buyers tax to cool the market, then it slowed, followed by more free money for first time home buyers to keep the up trend in place. The big key is in Ontario where an election is coming for spring 2018. We might have another year to go. Thanks again wolf. Really enjoy your site and the hard work you put in. You’re a content machine. Who says robots are taking everyone’s jobs ? Then greenbelt has nothing to do with anything. ‘The Chinese both local and foreign were and are 100 percent responsible for the entire housing bubble. It is going to hurt some property bandwagon riders, and that is all I can say about it. People need to have their heads examined if they think a million dollar fixer-upper in a choking city with traffic gridlock could ever be a good idea? Instead of asking, “Are they nuts”? The new mantra will be, “What were they thinking”? (Perspective. Avoid the rush.) Why do people allow themselves to be stampeded into unpayable debt servitude? Meanwhile, the housing pressure has spread elewhere to varying degree. I live about 2/3 up the east coast of Vancouver Island. People are moving to Vancouver Island from all over the world, but particularly from Canadian cities. Luckily, I live in a rural valley that is somewhat limited for speculators. Big land parcels are virtually non-existent. Farms cannot be be sub-divided by law, and most of the timberland is Crown forest, and owned by the Province (the People)…it cannot be sold, either. Private timberlands are sometimes parceled out, but the process is rigorous and is only done down-island where there is a market for it. I have lived on Vancouver Island for the past 50 years and my wife and I are in one of the last safe bastions from development (Thank God). Meanwhile, Trump has slapped a softwood duty on our lumber exports to the US. The result will be something similar on this end on some other US export, and Canadian lumber producers will just become more efficient (like what happened last time). And…US home builders and buyers just had a price increase on future sales. I’ll have to tell my sister not to visit this summer until this is resolved. People tend to get upset around here when they see US license plates; especially when they just lost their job because of tariffs. Glad I’m retired and out of this damned mess of an economy. We could survive without a pension if need be. The way this is going, we might have to. Yeah … aint that a brilliant move ? Our ‘ so called ‘ president raises tariffs on imported CDN lumber we depend on for home building by 20% which will lead to a 20% increase in the price of building a home all of which will be passed on to the buyer/consumer at a cost well in excess of the original 20% in an already over priced housing market . Not to mention what that’ll do to the home remodeling industry … as well as making enemies out of long term allies . But hey … Make America … errr .. something again . The price of lumber is only part of the cost of building a home. So only the cost of that part will rise by 20%. The overall increase would be much smaller. Please do not listen to this nutbar as there is no danger or hostility toward American Tourists on Vancouver Island or anywhere else in Canada. The hostility is toward the Chinese race. Bullish TINA and second and third tier Canadian cities. Before you can get higher rates you need to drain the punchbowl of bath toys and swim fins? What impact if any do you think having a recourse mortgage in Canada will have verses none recourse mortgage. Do you think that Canadians will be less likely to walk away from there mortgage compared to their american counterparts due to the difference in mortgage structure. The word mortgage is derived from a “Law French” term used by English lawyers in the Middle Ages meaning “death pledge”, and refers to the pledge ending (dying) when either the obligation is fulfilled or the property is taken through foreclosure. In the US, about 38 states, including Florida, have full-recourse mortgages, similar to Canada. Only about a dozen states have non-recourse mortgages, including California. In the US, it made no difference once the housing bust started. Florida was one of the epicenters of “jingle mail.” So I doubt that it will make any difference in Canada. Reason, there are two other big differences, as I understand it. Canadians only get tax benefits when they sell (vs. Americans who get to deduct mortgage interest and property taxes annually), so they are incentivized to hold on to their homes, even if it’s just a psychological thing. Sub-prime loans in Canadian are also supposedly held to much higher standards than those in the US. So, what I have gathered from the Canadian analysts that I’ve listened to is that the Canadian bubble pop will definitely be different from the American one – they won’t walk away unless they are forced to, and the least qualified Canadian buyers have more assets than their American counterparts so they can put off foreclosure longer than Americans could. It might take 2 decades for Canadian families to recover from this, though. Having lived through this senario. As a very positive assessment. Many family NEVER recover from this, as they loose all their family Equity, and have to go bankrupt as they are underwater, having tried to wait the correction (Or dead market. Sometimes the market simply goes dead instead of correcting) that goes with the interest rate rise out. Discharged bankruptcy will follow them for ever even though officially it should not be held against them. The last bust started in 1989 and ended in about 1994, the next boom started almost immediately and ran till 2008, where prices have been propped up be ultra low interest rates. The main governing factor is interest rates. Canada has seen the asset price inflation of falling interest rates, they rise it goes bang. The decision was made to let Central Banks control economies with interest rates. Around the same time the US moved to variable rate mortgages with a short fixed rate at the start (like the UK). Two decisions that come together in a calamitous way in 2008. They look at the historical data for the US housing market, forgetting they have just made mortgages much more interest rate sensitive with the new style mortgages. Alan Greenspan lowers interest rates to get the economy going after the dot.com bust, the interest rate sensitive housing market booms. Alan Greenspan raises interest rates to slow down the over-heating economy, the interest rate sensitive housing market busts. Oh dear, the US moves back to interest rates fixed for the full term on mortgages, Central Banks using interest rates to control economies and interest rate sensitive mortgages were a recipe for disaster. The world outside learns nothing. Some finance entities will sell you a split partly fixed and partly Variable for 5 -7 Years Normally the variable segment is also a revolving line of credit facility. These days most entities will only sell you fixed for the whole term, if the rate is punitive, in case there is another interest spike and they miss-out on some profits. Most Mortgages have interest review clauses in them. If they didn’t, I would be VERY very rich. Discharged bankruptcy follows then for 7 years. In the computerised aged people are still getting turned down or being required to provide extra guarantees, 15 years after they are discharged because they went bankrupt 23 plus years ago. What is supposed to happen, and what is actually done to the little people all over the planet are very different things. Personal bankruptcy for the little people, is a life sentence from the global financial industry, no matter what the laws say. Where did you get this idea? If anything Canadians in general have less assets since the income in Canada is much lower. Canadians have a lower per capita income and wealth. However, my suspicion is that if you were to account for the gross inequality of the US, the average Canadian is actually doing reasonably better than the average American. In other words, take out the top 10% of income/wealth from both countries, and I suspect Canada has higher per capita income and wealth. Imagine a world where people who HAVE money view prime real estate markets as a toy that they can play with and simply buy up all the assets from people who can no longer afford the holding costs. Imagine said group of wealthy people are assured that their wealth can never go down, because its all assets and stocks and things that if, well, things temporarily go down, the Central Bank will just ponzi the hell out of their balance sheet to make sure they hit new highs after a short while. So, what does this mean? Simple, you just have a concentration of assets into the hands of those that will be kept rich. That is how the last housing bubble ended and all the others will be resolved the same way until the pitch forks finally come out. One single house is a dead rotting non-performing asset. You think anyone is crazy enough to >use their own money< to buy more? “One single house is a dead rotting non-performing asset. You think anyone is crazy enough to >use their own money< to buy more?" Two great reasons to buy land/housing when money isn't an issue: 1) as a store of wealth that is relatively insulated from currency and market risks (e.g. the wealthy Chinese buying US and Canadian housing). And 2) to generate rental income that is, again, somewhat insulated from market risks. People NEED housing. They don't need stocks and bonds. Haven't you ever seen "It's A Wonderful Life"? Does the name Henry Potter ring a bell? Because there's lots of Henry Potters out there today just itching to churn out Pottervilles. I doubt there is much money to be made out of renting houses in Canada since this is their hottest rental market. A bit off topic, but for some historical perspective, this is the EXACT reason why many of the Founding Fathers, along with people like Adam Smith and Thomas Paine, supported estate taxes. Because wealth begets wealth, allowing the wealthiest families to continue to hoard wealth and land over generations and increasing inequality is one of the most anti-democratic things possible, as it essentially creates a modern day aristocracy. Here we are: America, 2017. A modern day aristocracy. Except you know what? Expecting some revolution is ridiculous. Most Americans are too fat, lazy, and ignorant to bother grabbing the pitch forks. Way easier to just blame the Mexicans, Muslims, and Mandarins and elect a wannabe dictator instead. Trusts and Offshore Corporates, have negated Estate taxes. Estate now only captures those who don’t plan. Or cant afford to, it is obsolete theft. It is now mostly taking from everyday people as the threshold is way to low in an economy where multi million dollar condos/houses are everyday events. I brought my first house for $12,000.00. Today the same house. Is $1.75 M, municipal taxation value. Which in many countries, puts it in the death tax, theft band. Before considering any other assets. Today Death Taxes are simply THEFT everywhere. I work for a large trust company. This is simply not true. Again, this is simply not true. Our largest clients all pay estate taxes, even after setting up a litany of trust devices to minimize the impact. In the US, for a single person the estate tax starts at nearly $5.5 million. There are more countries in the world that DON’T have estate/inheritance taxes than countries that do. Canada, the topic of this article, has no estate tax. Then its not avery good company, as it isnt doing its job, and protecting the estate, from unfair taxation. You appear to US based, and simply making life easy for the IRS, at the expense of the estate. First the Fed raises Interest rates – With the banks and lenders then following suit by raising mortgage and loan interest rates ..
… yet as of 4/24/17 the WSJ reporting mortgage interest rates are once again in decline . So where’s the logic ? Assuming of course there is any . Mortgage rates follow 10-year Treasury yield. The 10-year Treasury yield plunged recently, even as the Fed is openly planning the unwinding of QE, and even as short-term yields rose. So the yield curve flattened further. Something is up. Not sure what. Thank you good sir ! That lends understanding to what appeared to be a major contradiction . Greatly appreciated ! Bond market is not buying the growth story that the Fed is selling. That is it, part and parcel. 10-Year is basically inflation + real growth. Growth is flatlining and inflation is basically riding the wave of oil– which is to say, it is not economic activity and “full employment” (har har) which is driving inflation (which wouldn’t be a bad thing if it meant wages and spending were driving inflation), but it is essentially oil prices alone. As oil recovered from the 2016 bottoms, inflation picked up, but now that it has stabilized and even dipped back below $50, inflation once again was below the Fed’s target. This has happened numerous times over the last seven or eight years; the Fed threatens to tighten (either by tapering QE or raising rates) on the narrative that we’re -finally- reaching escape velocity for some real, robust growth and higher inflation will be hitting any day now > bond market reacts by rates increasing > growth and inflation come in lackluster > bond market realizes Fedtalk is irrelevant, and rates come back down to the reality of a lackluster economy. The Fed has, by and large, lost credibility with the bond market at this point. It is why I’ve continuously said rates aren’t going anywhere barring some sort of economic miracle (and I don’t believe in miracles). The Fed may raise once or twice more, but I’m skeptical of even that, especially if ANY crisis hits (Gov shutdown, China/emerging markets, geopolitical (N. Korea, Middle East, Russia)). Wolf, want a fun activity (and I personally think it would make for an interesting article)? Go back, say as far as 2010, and read the quarterly Fed minutes, particularly when something big was happening (QE, taper, etc.). It’s almost comical to read that in 2012, the Fed was worried about growth that was too strong, and inflation that was too high… and again in 2013… and 2014… and 2015… and it has NEVER materialized. QE has been utterly worthless in generating economic growth and inflation (CPI, I’m ignoring asset prices on purpose). I don’t believe the silly Fed conspiracies that they’re trying to wreck the economy… makes no sense… but I do believe they are (wrecking the economy), not out of nefariousness, but incompetence. They are professional mathematicians who try to force-fit the economy into their hopelessly unrealistic models and data (such as “unemployment” which of course as most of know, ignores the “underemployed”), and the results speak for themselves… poorly. Awesome comment thanks for that! Its becoming very apparent that 93+ months into the post-crisis ‘recovery’ that QE isnt working and the Fed really cant raise rates for a variety of reasons. I think buying some TLT LEAPS and shorting the Yen and Euro are in order right now even if we do end up with a blow off top in the equitiy markests the next few weeks/months. But will ‘buy the dip/TINA keep turn this into a roller coaster ride all the way down??? A lot of money seems to be going back to the EU in a perceived risk off in Europe. So risk on buying in Europe. To many people with eggs thinking the will have many chickens. IHMO. I don’t know why I keep on hearing that the gta has a supply issue. I work in residential construction and I can tell you first hand that we have a shortage of tradesman. They can open up the entire green belt and it wouldn’t matter. There is nobody to do the work. The real problem is low interest rates for too long. People don’t look at total debt anymore they just look at monthly payments. When it turns and it will, this will end in tears and it will kill the middle class. They buy to sell after a couple of years for a handsome profit. Rince repeat. So, they naturally do not look at the total debt but only a the monthly payments. These days, few buyers look to actually own the propriety for good. It’s the musical chair game. The solution is simple then, rates will not be raised. AND the Canucks can introduce Negative Gearing, copying a best practice from another Commonwealth nation. Looks to me like the Ponzi has peaked. What are the odds of Goldman taking out a massive short position, then ordering its helmet-haired hobbit at the Fed to hike interest rates by .5% or more and implode these Ponzi markets and asset bubbles. In Canada 100 bps would cause a housing downturn worst than the US, the Canadian media frets about a 25 bps increase, 100 bps is not even a consideration right now, no one with mortgage or consumer debt can even think about what they would do if it went up by that much, right now. Much of our debt in Toronto have variable rates so people can take out bigger mortgages to afford a detached home or decent size condo (greater than 500 sq ft). In Toronto, if you bought a house for $500,000 for a variable rate of 2.25% and your house value is now $1,000,000, your bank may have given you additional credit by giving you a home line of credit of about $250,000 – $300,000. People have redone kitchens and basements ($15,000 to over $50,000 each), bought or leased expensive cars ($60,000 or more before taxes), 4K TVs, vacations and gifted money to kids or family so they can buy homes too. Everything went on the credit line and people pay the minimum variable rate on all this debt of 2.25%. Some people who bought in 2014 or later actually have 2 or 3 mortgages at variable rates: one to qualify for the required down payment and then the other two to pay for the rest of the mortgage. This also helps them to qualify for a longer amortization period of 30 years. Then there are the “investors”, local people who used that home credit line to buy condos in major cities or homes in the suburbs to keep vacant hoping the price will keep increase to sell at a profit at a later date without the worry of a tenant causing wear and tear to the property; hence, the shortage of housing and skyrocketing rental rates in the areas around Toronto and Vancouver. Now we have the problem with people who invested in syndicated mortgages and have given borrowers $25,000 or more, to buy homes or apartment buildings. Some of them have not seen the properties built or received interest or the full return of their initial investment. There’s talk of a vacancy tax in Toronto, but I doubt they have the guts to implement it. They don’t want to find out how many homes are really vacant by local people versus the foreigners they blame for the housing mess. Canadian speculators and the previous government created this problem and our current government is too scared to completely solve it. We also don’t have transparent housing data to tell us why prices keep rising so much. What kind of government allow banks to lend billions of dollars each year and not verify what people are doing with the money or verify their true net worth to see if they can even pay it back? A vacancy tax is 100 percent meaningless if home prices flat line or or decline. Annual home price increases would have to be substantially above the yearly inflation rate each year. At these levels that’s impossible so the vacancy tax will do nothing. You have to get to 20 times the US level to mimic 2008, it was the derivatives that did the damage. We should still put Canada on suicide watch, it’s going to trash its economy. Interesting to see if here in Oz a similar play will happen. In Sydney 78 out of its 400+ suburbs have average home prices of $A 2,000,000. [By contrast out in the country houses are 1 tenth of that]. So Sydney is quite a bubble, even if “they” say it isn’t. ‘My’ suburb, with 20,000 taxpayers has a $A3billion tax bill so I suppose they can afford the $A3,500,000 average house price. It’s a nice old money suburb. Bizarre though. but Sydney is popular with the wealthy, the most popular destination for them, according to Knight Frank RE. Those” 1/10th the price of houses in Sydney” must be way, way, way out in woop woop!! Well, I guess that some people would say that 250 kilometers from Sydney really is the sticks, but hey yeah you can buy a 60 to 70 year old ‘fixer upper’ for around A$200,000 or so out there. Most decent places seem to be in the A$400,000 area or more. No idea if you could find work and I doubt that there are any universities there either. Taree, NSW, seems to have a lot of reasonable priced houses for sale, but I’ve heard that the area isn’t the best as far as the economy is concerned. Once the US or Canada bubble implodes, Australia will follow and follow fast. Oz has nothing to do with the Canadian or American property bubble. The bubbles bursting there will not cause the bubble to burst here. 1. Immigration – if and when the number of people coming to Australia is reduced by the government it will directly affect demand and in turn prices. 2. Additional taxes on RE purchases put on by either the state or federal government that are ‘too high’ for the marketplace to absorb. Maybe Canadian banks will be like Australian banks: make record profits as the banks pull in the difference between the spread. Don’t worry, the big end of town always makes out nowadays. Watch for record profits from all the Big Four banks downunder in Oz to be reported over the next couple of weeks with more to come as they increase rates…. If the main centres, Syd, Mel, Per, don’t slow or stagnate, a big flipper and vacancy tax, will be put on. Are interest only loans available in the US and Canada. In Australia, interest only loans represent 40% of all home lending and are a big favourite with investors. Basically how it works is an investor borrows a million dollars to buy a million dollar home. At a rate of 4.5% the investors annual repayments are $45,000. Such a property can easily Be rented out at that amount. There are 2 rising problems. The first is that there have already been 3 interest rate increases by the banks in the last few months. The second problem is that these loans reset after 5 years when the principle has to be paid down. As these loans gained huge popularity back in 2012 when they were first introduced, many are about to be reset. This first wave is about to hit but will soon turn into a tidal wave of loans needing to be reset requiring the repayment of principle. Reckon this is what our Central Bank are now worried about with many bubble deniers in media, government and academia now yelling ‘bubble’ so they can cover their arses when it pops. But never mind, with our latest Reality Television show called ‘Flip that Property’, I’m sure this bubble has more life in it yet. The economy is still crap for most real people (the bottom 80%). By the Fed’s admission we’re at full employment, there are labor shortages and the economy is in full swing. Yet the Fed Funds is sub 1%? There will be no crash, ever. The only thing boosting GDP (besides medical) is new homes and home improvement. This blog does not realize the US has transitioned to a Chinese form of capitlism in which both the govt and big biz cooperate to keep all the balls in the air. Expect home values to triple in ten years. Yes, it can go on forever. Please tell me why it cannot, as long as the govt continues to fake economic stats and print dollars. In ten years housing values will triple in the USA. OK, how many reasons do you need? Because there is this thing called “principal” which you must still pay, and even with no interest at all, there are limits to what people can afford. A 30 year mortgage with 0% interest, on a $500,000 house is a monthly payment of $1388. Tripling that, it becomes $4166 a month. You would need an after-tax income of $50k just to pay for housing alone. So there’s your first reason… there are absolute limits to what can be afforded, unless we move to severely negative interest rates (which would crush banks and crash the whole system likely), or hyperextend mortgage terms (50, 100 year mortgages). Two, there are these things called “recessions.” They happen, without fail, every few years, even in countries like Japan, where the Central Banks have been experimenting with various QE programs and intervention for decades now. When a recession hits, people can’t make payments… houses get foreclosed… prices drop. That’s, by the way, ignoring all the knock-on effects of a recession. The government is not faking stats or printing dollars (in the way you think they are). They are, in fact, quite transparent in that the vast majority of their data sets are publicly available for download. Now, for example, I don’t agree with what variable they use for unemployment (U3), since I believe U6 (unemployed, marginally attached, and part-time looking for full time workers) is more indicative of the ‘true’ economy, but the thing is… they calculate and publish both, and they will even tell you why they use one over the other. Keeping rates artificially low only protects the idiots and fools and malinvestors who over invested and made bad investment decisions. Its not free market. Why protect these fools? Better to send the bankers involved, to jail. Housing, art, rent price inflation is only the beginning of inflation and the only way to control inflation and prevent the devaluing of the currency is with higher interest rates which would cause deflation and lower prices. That would be beautiful. The system will absolutely not survive with artificially low interest rates as it encourages more debt that can not be repaid. The only way out is to bite the bullet now and raise interest rates and have only the Treasury not the banks issue debt and interest free currency to pay off government debt slowly. Failing that there is no way out of the debt trap without catastrophic consequences. In the end DEFLATION is better than inflation or hyperinflation. Canada’s biggest mortgage lender just crashed by 64.95%. But I’m sure this is just an isolated incident and not a sign of a systemic crisis…I mean, Jim Cramer would’ve warned us if something serious was afoot. Please quit saying the “biggest mortgage lender.” Home Capital is only the biggest “non-bank” mortgage lender. The banks are FAR bigger. Home Capital is minuscule compared to the banks. In terms of the overall Canadian housing market, Home Capital is too small to cause a major upset. And there are other “non-bank” lenders that will do subprime and liar loans if this company collapses. But it is a canary. We had a Shadow/Second tier finance industry correction, started by a ver similar entity to them, but it didn’t make it to the First tier lenders (Bank’s). To tell you the truth I thought it was all done on purpose by helping all the Pakistanis and Punjabs to buy houses. I thought it was a concerted total effort by all the banks. It wasn’t until short sellers from America blew the whistle that anything happened. Just like what we saw with Conrad Black. A lot of loans are liar loans, even from the main banks, Home Capital is the canary in the coal mine. Many lenders bent the mortgage rules or turned a blind eye to the 2nd and 3rd mortgages people were getting to qualify for very expensive homes. High interest savings accounts withdrawals from Home Capital dropped another $290 million Thursday. On the positive side, the boom is not countrywide but concentrated in specific areas. How bad it’s going to be hard to gauge, the new negative is financial shenanigans, leveraging up the losses. I bet all those people from Nepal, Pakistan, Sudan, and Bangladesh can afford 2 million dollar houses :). What mortgage number are you using to determine the yearly increase? The average home price of last month? You must remember only a minority percentage have bought homes in the last 2 years! They may live in a million $$$ home, however they only paid 600k or another number which is must less! The smaller the mortgage the less impact on a persons ability to finance should interest rates rise! A “payment shock” is when homeowner A bought a home for $X with a mortgage payment of $3,000 a little while ago. Then rates rise. Now homeowner B buys a home for the same $X (same purchase price), but the payment is suddenly $3,400. And since that would be out of range for that buyer, the sale doesn’t happen. The buyer will look for something cheaper. When enough potential homebuyers are in this situation, it will pressure down prices. It will also impact homeownes who sell one house and buy another (to move to a different location, get a larger home, etc). This is a well known problem. When rates rise, many people cannot afford the sell their home and buy another home, even for the same price. The denial of some folks here about interest rates is astounding; rates have already been increased 3 times in the past 15 months, and are like to increase 2-3 more times this year. You say “rates can’t go up” but they have and will continue to go up. Even if the Bank of Canada holds firm on rates, mortgages are already going up (+ .5% avg. for fixed rate IIRC), and even the shady subprime lenders won’t be able to stop the upward trend. Listen to the guest on the Canadian business network talking about a 50 basis point increase. ZERO delusion here. Those are TOKEN rates only – sure they can do 3-4 25 bps rate increases. So what? If they get anywhere near ‘normalized’ rates (say 4-5%) in the US then the federal budget will be 50% interest payments and will crowd out all investment. And simultaneously wreck the housing, equity and fixed income markets. No way the Fed allows that. They are already so far gone in their con game of selling Treasurys to themselves effectively and thinking that the economy is at ‘full employment’ that they nobody in the bond market trust them anyway. Everyone is looking at a worldwide bankster money pump [see Financialization] that has reached peak debt & deficit resulting in a structural worldwide banking Hegelian Death Spiral that will eventually take out the worldwide banking system as soon as any part of the corrupt architecture can no longer be maintained. The prevailing weakest link in the chain of illogic will suffice to bring the house of cards down swiftly when hyperinflation manifests in an uncontrollable fashion. Housing is currently hyper-inflating at a rate of 4 standard deviations plus resulting in a 33% increase in housing costs in Toronto over a one year period. Taken together, we can assume with 100% accuracy that when Vancouver & Toronto reach 5 standard deviations of skew in the overall housing distribution it will be GAME OVER.